As our business has grown, the market place has become more complex and competitive. The demands of our customers, and their subsequent definitions of value, have grown and became more varied. Ashley Industrial Molding has been challenged to meet these needs and so has added technology to our manufacturing process flow to service our customers. 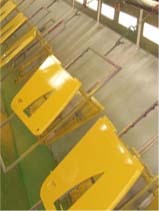 AIM has two paint lines that are set up as a single-pass 2K system. We have added robotic routers and water jet systems to enhance our secondary operations. The need for assembly capabilities have been met with heated bonding units, robotic adhesive dispensing arms and hardware assembly cells becoming part of our everyday operations.